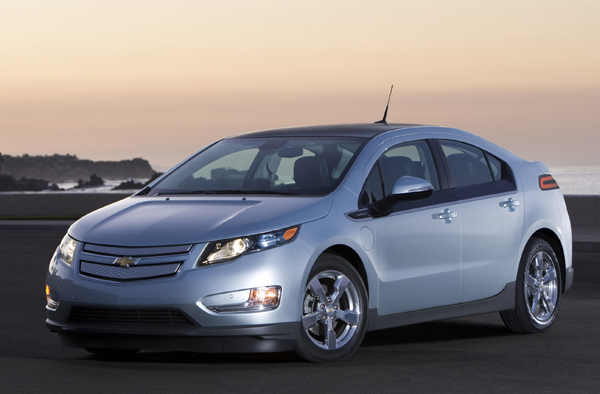 The Chevrolet Volt is the 2011 North American Car of the Year. The industry’s most prestigious product award was presented at the North American International Auto Show in Detroit January 10, 2011. Nearly 50 independent automotive journalists, representing dozens of separate media outlets in the U.S. and Canada, New Car Test Drive among them, cast a series of votes to determine the winner of the title. We voted for the Volt, but deciding among the candidates for 2011 North American Car of the Year was difficult. The Hyundai Sonata, one of the three finalists, was our pick among, well, normal cars, offering a broad lineup of superb models sporting innovative technology. The Nissan Leaf is a compelling choice as the first all-electric car sold in America in significant quantities. It drives well and would work well as a commuter car, though owners have to plan a bit more. The Chevrolet Volt seems the best answer for the times, however. The Volt works just like an all-electric car for the daily commute and many owners may only rarely have to put gas in it. Yet, when needed, the Volt has an engine and a gas tank, so it will never leave its driver on the side of the road due to a lack of conveniently located electrical outlets. The Volt feels like a premium product. It’s remarkably refined and easy to operate. Volt won the final vote by a wide margin. The Volt won with 233 points followed by the Hyundai Sonata with 163 and the Nissan Leaf with 94. Each of the 49 jurors cast 10 points, though they could be distributed to more than one car. “The Chevrolet Volt is a breakthrough vehicle that shows that an electrically driven car can be totally practical, and more importantly, the only car a family needs,” wrote John Davis from “Motor Week,” which airs on Speed and PBS. “It provides the typical commuter with tailpipe emission free travel to work and home again, while relying on an efficient gasoline backup system for emergencies and longer trips. The Volt is also exceptionally well executed, especially on the interior. The design is futuristic, yet sensible and downright simple in operation. Also, there are enough electronic displays and gadgets to keep any tech-savvy driver happy, as well as help buyers get the most efficiency out of the car. Paul Weissler of the industry journal Motor said, “We’ve debated the ‘what is it’ subject, and my conclusion is that it’s a plug-in hybrid with enough all-electric range to satisfy many one-car-owning commuters. Is the price higher than the most cost-effective approaches to a commute? Well yes (although mitigated by a Federal rebate), but a new automotive purchase is typically beyond pure cost-effectiveness. A car can satisfy a variety of emotional needs, and people spend more than the minimum (often far more) to obtain them. For some buyers, it’s high G-force handling, for others it’s a leather and wood interior that feels like a Fortune 500 company boardroom. And for Volt buyers it’s the chance to at least make a short commute each day without the purchase of gasoline. The Volt is the first plug-in hybrid, with a novel power flow, and for a car manufacturer that emerged from so much turmoil, that is noteworthy indeed. If gasoline prices spike, following the recent trend of crude oil prices, Volt sales could exceed expectations. Gary Witzenburg, who writes for AutoMedia.com, said, “Because it can run on battery power from the grid for the first 25-50 miles, then as far as needed on electricity generated by its range-extender engine, it’s a non-fuel-burning, tailpipe-emissions-free EV for the first part of each day’s drive, then a fuel-efficient compact sedan the rest of the way. Most importantly, it’s an electric-powered vehicle minus EV ‘range anxiety,’ that sweaty-palm fear of running out of volts before you run out of trip. Neither a pure EV nor a Prius-like parallel hybrid, the Volt is a game-changing range-extender EV that should enjoy a rosy future, especially if GM can get its price down and volume up over the next several years.